Why is the west coast shaking so violently? According to the latest data from Earthquake Track, there have been 698 earthquakes in California within the past 30 days. By the time that you read this article, that number will undoubtedly have changed. In recent days I have felt such an urgency to write about the seismic activity on the west coast, and I am quite concerned that so few people seem to be paying attention to what is happening. As I have covered previously, scientists tell us that when seismic activity begins to escalate the probability of having a major earthquake jumps significantly. 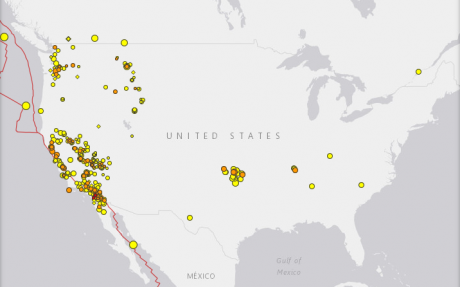 Over the past month there have been more mainstream news articles about earthquake swarms in California than I have seen in years, and the magnitude 4.6 earthquake that rattled Monterey County earlier this month made headlines all over the world. Spectacular eruptions have been seen Southeast of Mexico City as Mexico’s Popocatepetl volcano spewed smoke and ash high into the air. The volcano had three eruptions Friday, one of which reached two and a half miles into the sky. The first explosion occurred at about 5:00 p.m. local time. Two more explosions overnight spread ash over the villages and fields south of the volcano. I cannot stress enough how potentially dangerous this situation could become. In ancient times, Mt. Popocatepetl completely covered entire Aztec cities with massive amounts of super-heated mud. Scientists assure us that someday Mt. Popocatepetl will once again erupt in a similar fashion, and the devastation that this will cause will be off the charts. Volcanic eruptions on the Indonesian resort island of Bali have prompted officials to cancel flights and move about 24,000 residents out of the way as a thick ash cloud from Mount Agung, thousands of meters high, drifts east and southeast along the archipelago. Residents were evacuated from 224 points around the island while Lombok International Airport on Pulau Lombok, the island due east of Bali, has closed temporarily, said Ari Ahsan, spokesman for Ngurah Rai International Airport in Bali. The first eruption came around 5:30 p.m. local time (4:30 a.m. ET) Saturday, Bali’s Regional Disaster Management Agency said. More eruptions followed and continued into Sunday, with a “medium-pressure eruption” in the early evening that sent ash 2,000 meters into the air, the agency said. By late Saturday, the volcanic ash plume had reached an altitude of 7,600 meters (4.7 miles), according to Australia’s Bureau of Meteorology. Magma – molten rock – has now been detected close to the volcano’s surface, said officials and volcanologists. I know that the mainstream media is endlessly obsessed with covering the controversies surrounding President Trump, but to me all of this seismic activity that we are seeing along the Ring of Fire is the biggest news story in the entire world at the moment. I am convinced that what we are witnessing is quite unusual. All over the planet “dead volcanoes” are coming back to life, and major fault lines are being hit by a seemingly endless barrage of small to mid-size earthquakes. Is it possible that all of this shaking is leading up to something?